Horses have long been a part of Nebraska’s landscape and culture. The state’s 4-H Horse Program aims to bring along young riders who are responsible, self-disciplined, thoughtful and caring. 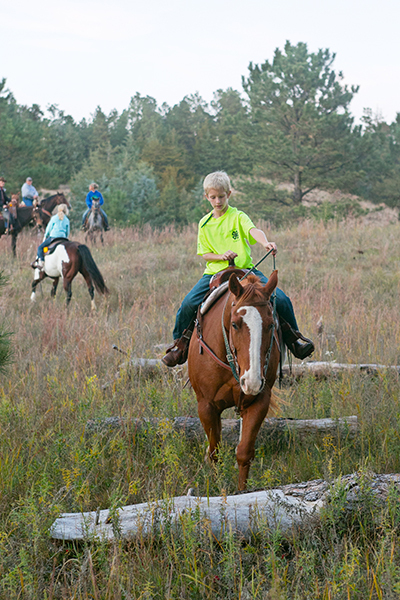 Kids and adults participate in the fundraising trail ride in the Nebraska National Forest at Halsey to celebrate its 20th anniversary. 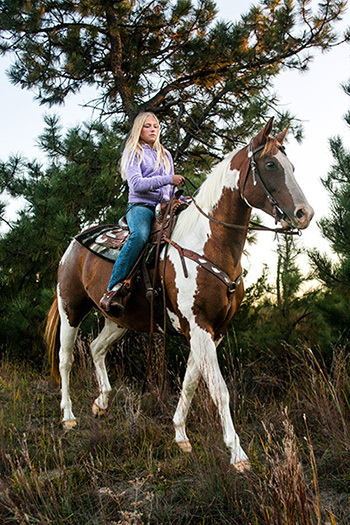 Lillyanne Lewis of Ord rides her paint horse during the 4-H Camp Trail Ride in the Nebraska National Forest. 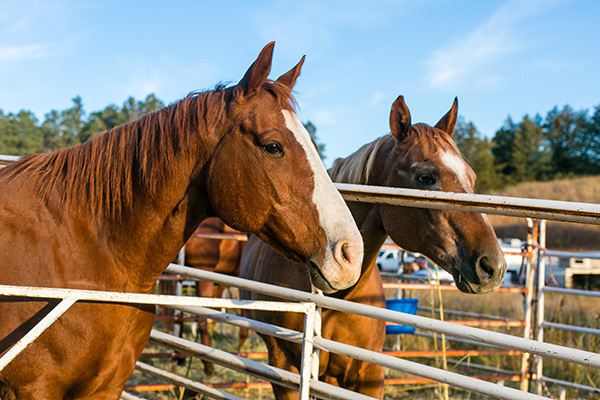 One such fundraiser is the State 4-H Camp Trail Ride in Halsey, which began in 1999 and celebrated its 20th anniversary Oct. 6-7, 2018. Located within the national forest, the Halsey camp is one of two 4-H centers in the state. It was dedicated in 1962, and in addition to hosting youth functions, the camp is also available to outside organizations and events; the Nebraska Game and Parks Commission’s Becoming and Outdoors- Woman Weekend called the 4-H Camp in Halsey home for many years. True to 4-H fashion, the weekend requires all hands on deck. Whether it’s local ranchers who lend their panels to pen in horses or donate Nebraska certified weed-free hay – required by law in the forest; or all the volunteers who keep the event running, who cook meals and spend time mentoring young riders while out on the trail; or the Nebraska Forest Service staff who agreed to maintain and open up a small pasture – now called “Windmill 25” – to serve as parking and trailhead ... the individuals who make the 4-H Camp Trail Ride possible could not be faulted for being short on heart. Treffer’s son, Greg, leads his horse over small log obstacles. Greg has also been riding since he was a toddler. Pulling in Nebraskans from all corners of the state – both city and rural, the forest’s central location sees an average of 100 riders each year, and in some years, the foundation may welcome as many as 150. Men, women, and children of all ages – including toddlers who share the saddle with their parents – have enjoyed Halsey. They come to explore the forest’s miles of pine-shaded trails, open Sandhills country, the camp atmosphere and friendships old and new. And after 20 years, many of these riders have become regulars, returning year after year – some coming back with growing families. 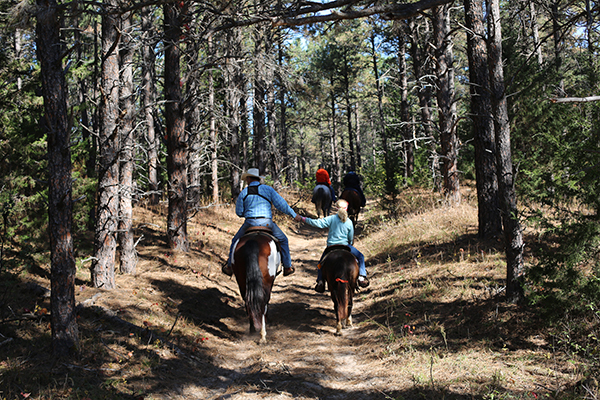 “You can see for miles and miles in the Sandhills areas, but when you get into the forest – even if you’re messing around for only a minute or two – you can’t see very far and you can get lost,” said Bruce Treffer, a 4-H Camp Trail Ride charter committee member. 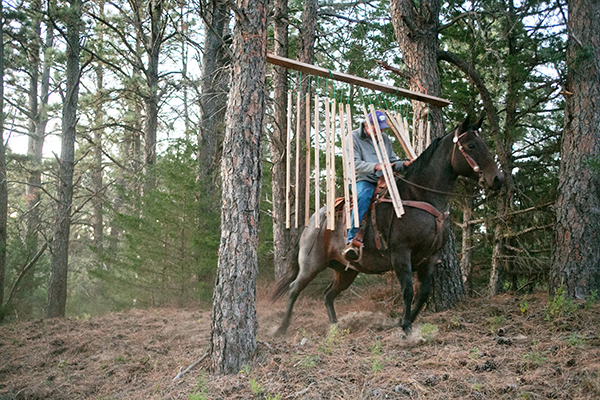 A rider urges his horse through a “scary” curtain of wood chimes, a desensitizing exercise that was part of a riding clinic available in 2014. “There’s an impact in seeing so many horses going out that first time,” said Teel. But once here, to ride as part of a a large herd is a magnificent experience. Then at the end of the day on Saturday, after a full day’s ride and a delicious evening meal of steak, baked potato and green beans, a bonfire at Windmill 25 completes the camp atmosphere. 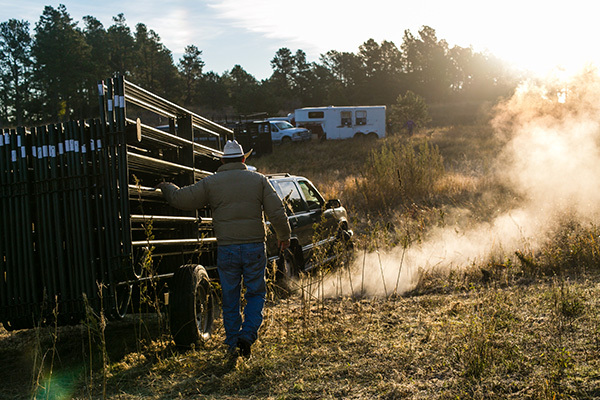 Staff recommends that participants drive into the Windmill 25 site with 4x4 vehicles. Port-a-johns will be provided, but those looking for a more comfortable camping experience may look to The Forest Service’s Bessey Recreation Complex and Campground, which offers water and electric hookups. For participants not hauling in RVs or live-in trailers, the Nebraska State 4-H Camp does offer cabins for a small fee, assigned on a first-come-first- served basis. There are also motels available in the nearby towns of Halsey and Thedford. 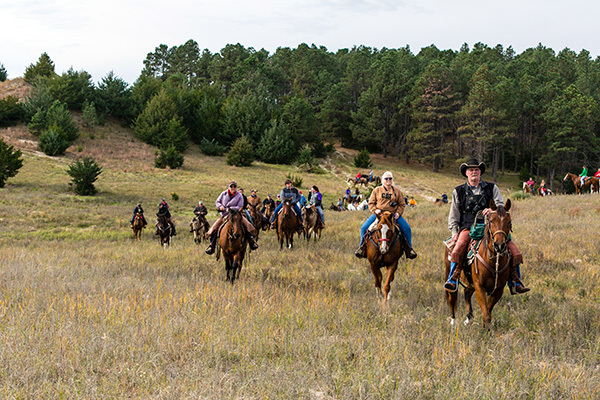 Riders Terri Licking (purple jacket), Kathy Potthoff of Lincoln and Bryan Bechtel (right) of Henderson and many others ride out of the trees and into more open Sandhills country. Learn more about Halsey’s trail rides.